Digital Art : Jonathan Ball is a digital artist and character designer based in Cardiff, United Kingdom. The creative and colourful creatures that have been informed by a life-long exposure to game and cartoon culture forms the world of Jonathan Ball. His expression of art is nature on steroids or the ever busy urban surroundings with lights. These characteristics are carefully created with the presence of atmospheric particles which gives life to the creation. 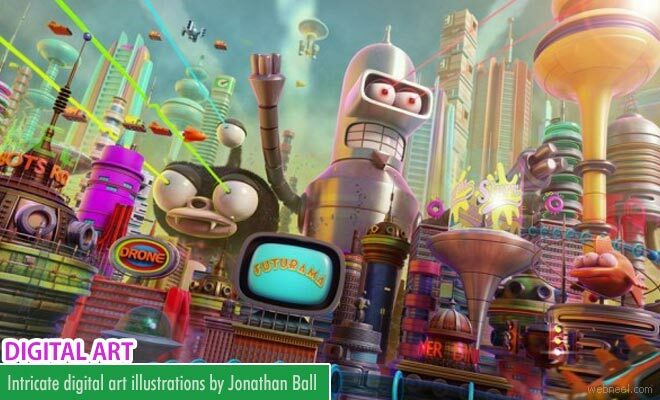 The character ans the props used in saturated colours and the depth seen in the illustrations clearly mark a niche for Jonathan in this genre of digital art. Jonathan Ball is synonymous with poked studio in Cardiff, Uited Kingdom.